It all started when House Minority Leader (and future House Speaker) Nancy Pelosi said that passing the bill would be a top priority if the Democrats win a majority. That was all conservative Christians needed to churn out the overheated prose meant to scare their followers. 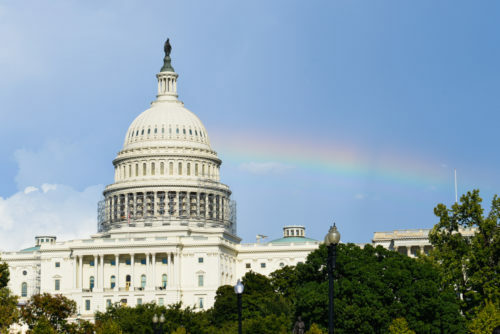 “The LGBT Bill You Should Know About If Democrats Take Congress,” CBN News warned darkly. “What the Equality Act does is it turns it on its head and allow the government to impose a belief system about sexual decisions and sexual behaviors on the nation,” Mary Beth Waddell of the hate group Family Research Council told the outlet. “Pelosi’s Top Legislative Priority Would Punish Dissenters on LGBT Issues,” the right-wing think tank Heritage Foundation proclaimed. “Democrats have tried to push the so-called Equality Act since the Obama administration, though it failed to reach the former president’s desk,” the ultraconservative Lifesite said. Some of the drama from the right is an attempt to make sure that evangelicals go to the polls. There’s some indication that the conservative fervor that emerged during Brett Kavanaugh’s confirmation hearings has worn off, so the right is using scaremongering as a get-0ut-the-vote tactic. That’s the reason why President Trump has been trotting out every racist and xenophobic canard that he can think of, in hopes of firing up his base. But the pre-emptive attacks are also a sign that the religious right knows that the House is a lost cause. In some ways, it will serve them (and their fundraising machinery) better if they have Pelosi and the LGBTQ community to kick around leading up to the 2020 presidential election. The sad truth is that the Equality Act is going nowhere, despite Pelosi’s pledge. With nearly 200 sponsors in the House, it’s entirely possible that the Democrats can get the legislation passed quickly. But it will be a symbolic victory. A Republican-controlled Senate isn’t about to pass such a bill (or even schedule it for hearings) and Trump will never sign it. Instead, the bill is the Democrats’ own get-out-the-vote tactic for the LGBTQ community and a thumb in the eye to Trump for his anti-LGBTQ policies. The religious right knows this, of course. But the idea of even a symbolic victory must be galling, after the unbroken string of successes during Trump’s first two years. So expect the rhetoric to escalate even further if Tuesday turns out to be a blue day for the Republican party.